VAUGHAN, ON--(Marketwired - March 30, 2016) - PowerStream, a community-owned energy company committed to safety, is once again partnering with the Ontario Regional Common Ground Alliance (ORCGA) to remind customers to call before they dig prior to beginning a construction project. Friday, April 1, marks the start of this year's 'Dig Safe Month', a provincial initiative to promote safety and reduce damages to underground infrastructure by raising awareness of safe digging practices. 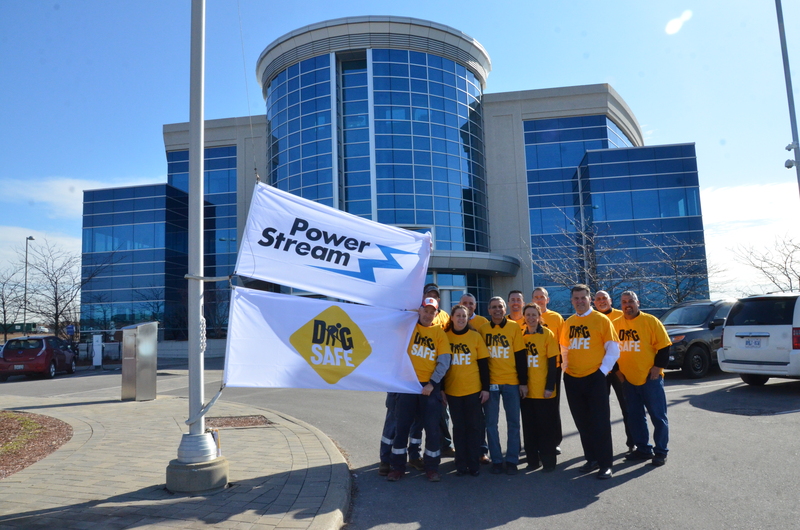 PowerStream is supporting Dig Safe Month in a number of ways, including ceremonial flag raisings featuring the Dig Safe flag at PowerStream's head office in Vaughan as well as the company's operation centres in Barrie and Markham. PowerStream's partners in a planned merger of leading Ontario utilities - Enersource, Horizon Utilities Corporation and Hydro One Brampton - will also be raising Dig Safe flags at their respective work locations. "Safety is a top priority at PowerStream," emphasizes Brian Bentz, PowerStream President and CEO. "Dig Safe Month is an excellent campaign that reminds customers of the hazards they may face by trying to by-pass legal procedures. What may seem like the simplest project could have lasting consequences if someone comes in contact with cables or other underground electrical equipment." PowerStream receives almost 65,000 requests for cable locates on an annual basis; cable locating is a free service for PowerStream customers. Locations of underground wires are marked in red on the ground. PowerStream has been a member of Ontario One Call since 2008 and has held membership in ORCGA since 2010. ORCGA is a member-driven association of 485 member organizations and sponsors representing 19 Stakeholder groups who have a "Shared Responsibility in the Protection of Underground Infrastructure". Established in 2003, the ORCGA is committed to saving lives and preventing damage to underground infrastructure by promoting effective damage prevention practices. PowerStream officially commemorates Dig Safe Month with its annual flag raising ceremony held outside the company's head office in Vaughan.